My girl is out of hospital and home. Over the last couple of days she's been unplugged from the various blinking, beeping, and puffing machines. Last week’s terrifying talk of intensive care seems an awful long time ago. 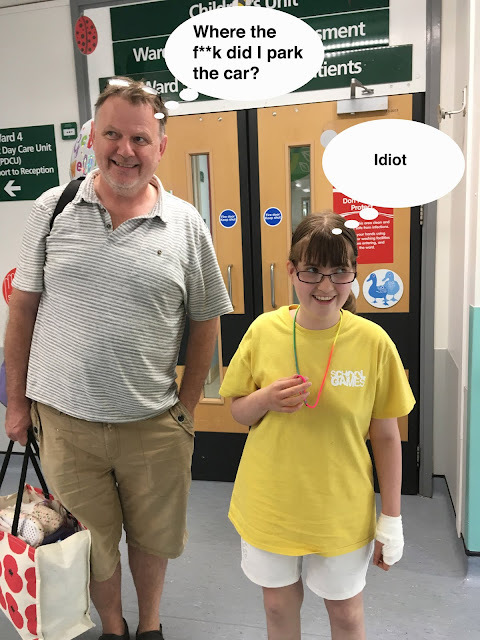 I knew she was getting better when she dropped a baked bean from her dinner onto the ward floor, and was concerned that she was “minus one bean”. Yesterday and today was mainly concerned with answering questions, over and over again. “What time am I going home? The nurses were primed to provide the right answers. Food arrived shortly before we got the all clear to go, and in true Magnus Magnusson fashion (I’ve started, so I’ll finish), my daughter sat and polished off her meal while we waited, clutching her bag of medicine and discharge letter, watching her. Smiling. So glad to hear that your daughter is well again! My heart was in my mouth. I've been reading your blog for quite a while but don't think I've ever posted, so I decided it was high time I wrote something. I love your way of writing - it's always very funny but articulate and moving too. Can't wait for the next update. Thanks, Katie. That's very kind of you. She seems to be back to her normal self - see today's blog entry!